Kat and Karl : BEER PONG! last night karl decided we were to act like we were freshman in college and play some beer pong! (object: two teams. six cups on each side w/ small amount of beer or drink in them. 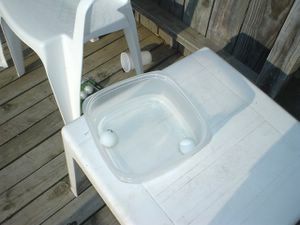 throw or bounce ping pong balls in plastic cups of other team. you make it, they drink what is in the cup. ping pong table not required) karl and i ended the night victorious w/ THREE wins in a row! Props of the night: Kat's shingaurds and Emily's undergarments. Plastic cups and ping pong balls...er.. BILLS!